Fittingly, I’ve book-ended the Bruce Munro installations at Waddesdon Manor, visiting only the first and last years of his exhibitions, since a ‘proper job’ meant I was unable to get to the intervening open evenings. And so it was a pleasure to accept this latest invitation to see the paths his dreams in light have taken. If that seems an austere approach at Christmas, it isn’t – visually at least. Bruce’s ethereal, elegiac and engaging installation glows through the shrubbery and his sounds echo across the gardens like mythical sirens calling passers-by. But as you make your journey towards the sounds, the giant tree ferns lining the path loom through the darkness, their white winter fleeces looking for all the world like bandages wrapped around dreadful wounds. 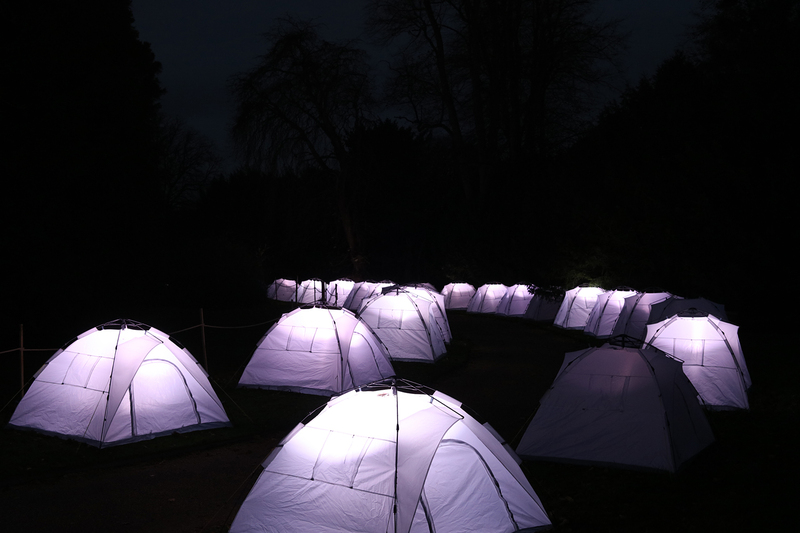 Once you’re standing alongside the site it is apparent the music is a series of segue-ways from pop to rock to opera, transmitting simultaneously from over 100 single-person tents, paying homage to the charity Shelterbox. The sound and light show lends the tents a disco feel, until without warning, the nylon canvasses shot through with the purple, blue and red are punctured alarmingly by white light accompanied by the ditditdit, dahdahdah, ditditdit of more than 100 SOS messages. This voyage of son et lumière, Bruce explains, has been inspired by the desire to couple his work with a specific charity and the teen memory of twiddling the dials on the radio to find a favourite station (he had to replicate some of the sounds with actors, since the BBC wouldn’t grant him a licence to use any original recordings). It’s all manufactured, of course. Anyone hovering around the same age as Bruce will remember not only the distant Morse code messages but the buzz of white noise and the seemingly meaningless repetitions of a five-note tune transmitting mournfully across the airwaves. But for all that the tents don’t house refugees, the effect is stunning nonetheless. It halts you in haunted tracks. Get away from the crowds for a moment if you can, and take in the installation alone. For it is only when you stop that the sound of your own humanity cuts through life’s hubbub and Bruce’s brightly lit tents encourage your empathy for fellow humans. NB: Bruce Munro’s light installation is part of the Winter Light at Waddesdon Manor Christmas season running from Wednesday 11 November to Sunday 3 January (closed 24–26 December). The seasonal decorations have been created in 20 rooms, including the Bachelors’ Wing, and around the manor’s exterior. 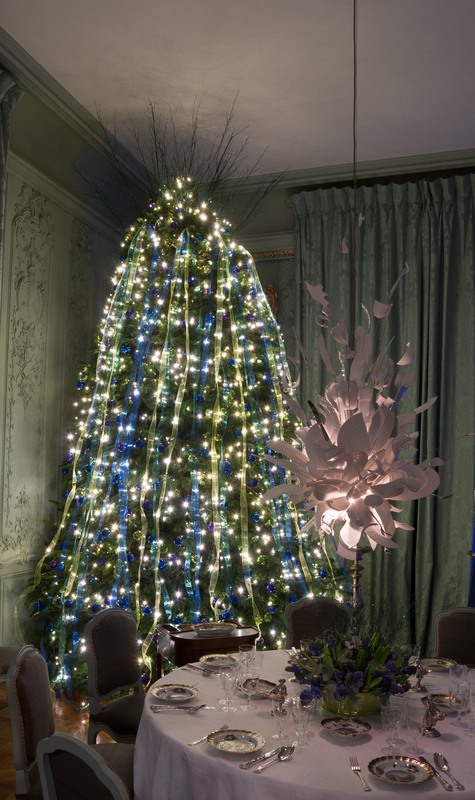 Feature table settings, Christmas trees and room tableaux continue the theme of Lights & Legends, all with a backdrop of the matchless Rothschild Collection and the manor itself. *If anyone cares to delve further into the history of the manor, during the Second World War, the Rothschilds moved into the Bachelors’ Wing, leaving the main house to children evacuated from London. To find out more visit the Waddesdon Manor website.